I love this carseat. My son is very comfortable, and secure. 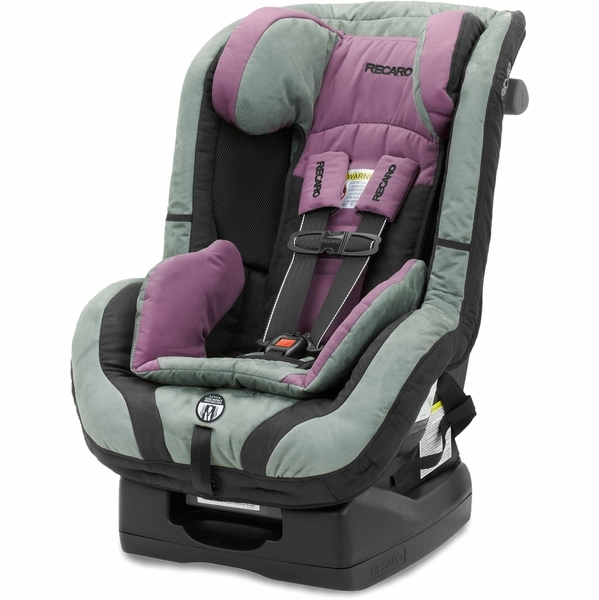 I own a Britax and this Recaro, and I would buy this over the Britax anyday. I'll never not buy a recaro car seat. My four year old was in the rear passenger seat when I rear ended another car at about 25mph. He was a bit shaken for a few moments but otherwise unharmed. I'm sure the other car seat manufacturers put out a terrific product, but I won't buy another brand. On April 08, 2017, my family was returning from there road trip to Carlsbad, CA. They were just south of Salt Lake City, UT when my father-in-law was hit from behind on I-15. His 2016 Ford F-150 was totaled. The rear glass was shattered. There were four occupants in the vehicle at the time, one of those being my daughter. However, she was in the RECARO Performance Booster. Needless to say the EMT checked her out in seat. He commented tinny wife that he had never seen such a car seat and loved the design. My daughter got a stellar review and walked away from the accident without a scratch on her. We love our Recaro car seat have had no issues it's easy to clean, remove and move from car to car and durable and super safe! Easy to install. Straps release and tighten smoothly and evenly. Good quality fabric. My son seems very comfortable. Easy to recline when rear-facing. Hits most of the marks - needs a few tweaks. We owned a convertible Recaro previously and absolutely loved it. It was easy to install, comfortable with all the extra padding, straps were smooth and easy to adjust, and the style was great. I was very excited to purchase another Recaro. The performance sport, however, is lacking slightly because of 2 major things for me. First, my 3 year old can't use the "cup holders". The design of the elastic, mesh is terrible. My 3 yo can barely reach them, much less actually get a cup inside of them. I was also disappointed that the user manual says that a child weighing over 30 pounds can not use the recline feature. I really needed the recline because my little guy sleeps in the car frequently. Very disappointed to say that I am having to return the seat because of that. Otherwise, the seat would be a slam dunk. I'd recommend if you don't need cupholders and have a tiny child that doesn't sleep in the car. So far so good! A little confusing to install - however our tall 7mos old loves this and is really comfortable in if. She usually screams in other car seats, but enjoys the ride in this well padded convertible seat! Best UsesBest for tall infants! I bought this seat about 2 years ago and have loved it so much that we actually just bought another for our other vehicle. My daughter even loves it. We are a racing family so of course we wanted to see what recaro had to offer and when we found one in pink it was a must have. After reviewing safety features and other customer reviews we knew this was the seat for us. The only problem I have ever had with this seat is the weight. It is definitely the heaviest seat we have owned between our 2 girls but I will take the weight for the safety features any day! 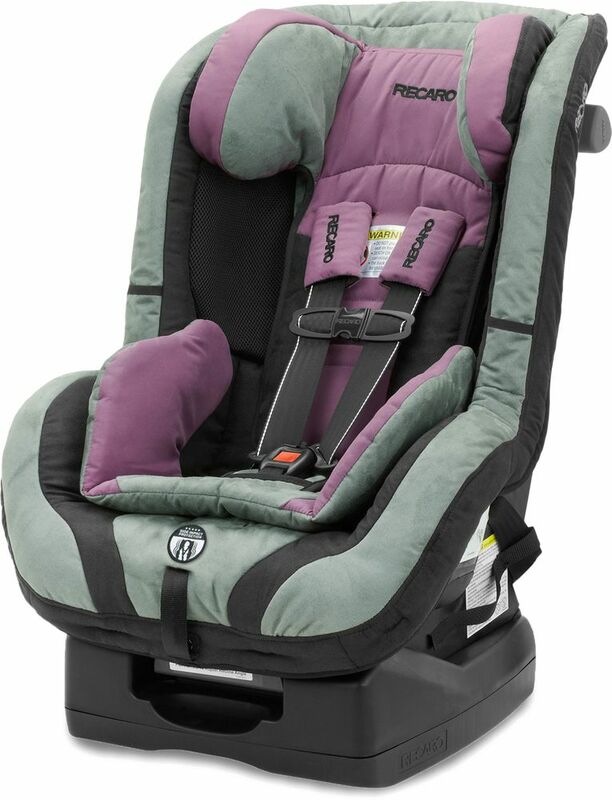 My grandson was ready for a bigger carseat and Recaro came highly recommended by a friend of mine (I had never heard of the brand) after reading reviews I ordered one for my daughters car.....loved it so much, I ordered a 2nd one for my SUV.....the seating feels so much more comfy than all the others I have looked at. The easily adjustable head and harness are awesome! I recommend to anyone that asks about the best brand!!!! I bought this car seat to use in my vehicle with my great-granddaughter. Being a retired EMS professional, safety is a major issue with me. After reading all the reviews and making comparisons, I chose this seat and am very happy with it. While it is a little difficult to install properly, it is so sturdy that I know in a crash, that child will not go anywhere. I would encourage anyone installing a car seat to go to a local fire station who has certified technicians who can assist to make sure the seat is properly installed. In late 2012, we purchased 2 of the ProRide seats (1 for each car) after researching options. After almost 4 yrs of heavy use, I am highly recommending this product. The cloth material is durable and easily cleaned. The cover can be removed and put on again with little effort. I do feel that the black cloth may have ever so slightly faded from exposure to the sun, but no other wear can be seen. There are no tears, rips, rubs, stains, or blemishes in the cloth or the plastic. My son eats, sleeps, and goes on 2500 mile round trips to Nana's in the seat. We have used the ProRide extensively. The seat belts have always worked perfectly. The belt latch is easy to buckle for my 4 1/2 year old, but he can not unbuckle himself from the seat. However, I can unbuckle him with 1 hand. The seat is easy to install into most any car, from a full size pickup to a Civic to the captain's chair of a Traverse - rear facing or forward facing - LATCH or seat belt. It takes up less room left to right than other options. The overall construction of the seat feels solid and more substantial than others. Our son has always reported being comfortable in the seat, and to this day will fall asleep in it. He never complained about the seat blocking his view out the windows, but does have to sit up slightly to see directly to his left/right. He is on the verge of being too tall for the ProRide, which is what brought me to the RECARO website tonight. If it is at all possible for you to afford a RECARO car seat, you will be very satisfied with the level of safety, durability, and ease of use. We have friends who went with lessor brands and they definitely regretted doing so. Some had to replace seats after a year or so due to wear/tear, some reported having to battle the install, and still others reported uncomfortable kiddos. Again, if you can afford the RECARO price up front, you will be purchasing safety, comfort, and ease of use that will last for the duration of your need. I actually purchased two of these seats, one for each of my daughters. These seats are incredibly comfortable for them! We've made quite a few road trips with no complaints (one from Alaska to New York with a stop in Texas). I love how long kids are able to use these seats! My oldest child has been harnessed in one since she was 4 and is still able to harness at almost 10. We were unfortunately in an accident that caused around $7,000 worth of damage to my vehicle. There wasn't a scratch on my daughter! 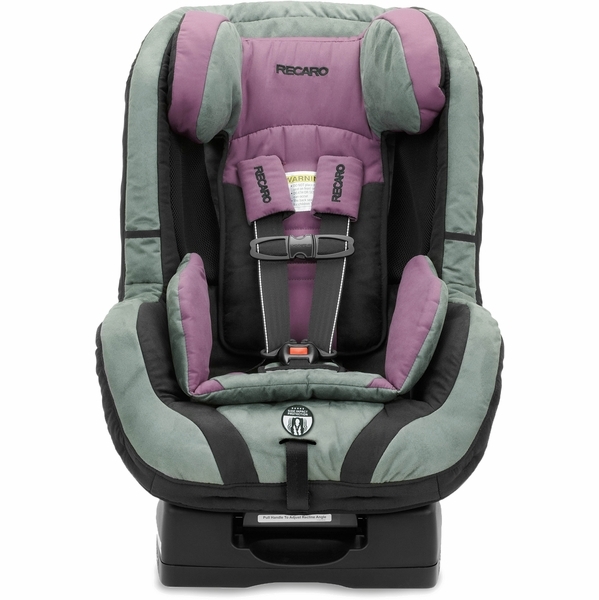 We love Recaro seats and will continue to buy them for the rest of our children! Our daughter loves this seat! We just had a son and you bet we already ordered one for him! The Hero design on the harness makes getting them in and out so nice and quick! 4 year old is long and lean and fits perfectly. This is her favorite car seat. She likes it so much, we are getting one for younger sibling now that he's big enough. I recently switched my son to this. He is still using the 5 point harness. This makes him feel like a big boy. We have 2 of these seats that our kids have been in since the age of 4 months. They are now 2 1/2 and 3 1/2 and I would never put them in any other type of car seat. They are sturdy, dependable, and what we feel to be the best in the market. We did lots of research prior to buying a car seat and Recaro won every other brand over in our book. We will be staying with Recaro when we need booster seats as well. My son loved this car seat better than the Chicco infant seat. It would keep him cooler and it has a lot more room. 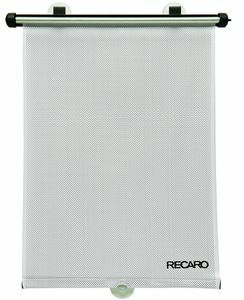 We decided on recaro before my son was born because of the great quality and features of their brand. This car seat although a bit bulky is easy to install, comfortable for my son and the straps never tangle which is an issue with some other carseats. I also love the variety of colors it comes in. We have had this seat for a few years now and it has grown nicely with my daughter who is almost six and 50 lbs (and tall). She is comfortable in it and it has truly accommodated her throughout her growth spurts and love that it will continue to grow with her! We got this seat back in 2013 for our first son shortly after his 1st birthday, he is now 3 years old. This car seat has been through A LOT but it is definitely holding its ground. We have had so many great memories with this car seat. We've taken it on several airplane rides which made our airplane ride super comfy. We've even strolled it through the airport using those car seat roller things instead of taking our stroller. We have taken it on two 10+ hour road trips. I have even carried it by myself from the back of the airplane to inside of the airport and vice versa while being 6 months pregnant. We love this car seat so much. Our 2nd baby is 6 months old and we are already talking about purchasing one for him when he turns 1. (don't worry he will be rear-faced, as was with my older son when he turned 1) My only ONLY con is that I wish the cup holder is built-in because my son always kicks it off so it tends to roll underneath our seats. Also it's a bit of a stretch for him to reach his drink. If it could possibly built closer, it would be nice. Overall, we love our car seat! I bought this to replace a Britax convertible seat and am very happy with it. It is well made and easy to install. It is big and heavy, like any convertible seat, but I like it better than the Britax. My baby is almost 3 months and she fits great on the smallest setting, I probrably would not have used it when she was an 8lb newborn. If you can get the 'hero' straps I would recommend them, they prevent the harness from twisting. We borrowed a friends extra Recaro sport seat from her hubbies car as our car was in an accident and we needed another seat short notice. I was pleasantly surprised how well this seat fit into our vehicle, how comfortable it was and that my child actually liked it. (He thought it was cool) I found the seat easy to install despite the weight but I expect a well made seat to have weight to it. So during the few days of using the borrowed seat I decided our new seat would be a Recaro Performance sport! Our oldest has out grown the seat height wise and thinking we were done with having more kids, I donated it to my sister as it had tons of life left to give. Well let's just say we will be needing another seat soon! Not sure if I want to try a full denali travel system or just go straight to a birth to convertible combination seat option. But either decision I know will be the right decision! #TeamRecaro! I own 3 of these seats! We bought a 4th for the grandparents car. This seat so easy and quick to install. I love how adjustable it is my girls never complain about being uncomfortable. I needed to buy replacement seat foam and straps and was pleasantly surprised in cost being so reasonable. My friend has one of these for her son! Wish I was able to afford one! But God bless everyone who has been in an accident and has saved their child's lives! We got the chance to purchase a Recaro and went for it. I seriously love this seat! The quality is amazing, it's easy to adjust, it's not too wide and not too skinny but just perfect in every aspect! I definitely recommend this seat, or any Recaro to everyone we know!!! I love that my 5yo can still use the 5 point harness and isn't clise to the height or weigh limits before I have to use the belt. The side impact is the best I found. So easy to install and use this seat. And after making my kiddo sit in many brands, he says this is the most comfy. This is my favorite car seat we own. I love it. It is the car seat that is easy for me to take in and out of our vehicles. All for of my kids switch using it. They all love it. Baby is SO comfy in this seat! I absolutely LOVE this seat. I have had a Summer, a Graco, & currently 3 various Britax seats in addition to this one for all of our kids between two cars & this is by far my absolute favorite seat. My son never cries in this seat. He never comes out sweaty, like my older son did when he was in an infant seat. & I feel like the HERO harness system should be required in all carseats. My older son hates those velcro pads that come on other seats and takes them off, and when his straps get twisted he gets upset, but my little guy's head is always cradled on the built-in padding of this harness, and it never gets twisted so it's easy to get him buckled up quickly with no fuss. I really can't say how impressed I have been by the quality of the seat compared to other brands. I did have a model with the recall on the latch system & my repair kit arrived shortly after I submitted the claim. We love this seat and think it's just fabulous. We've had the Performance Sport about a year now. The only complaint is that a couple of times the straps pinched my son's skin where the shoulder pads are when tightening them. I know that may happen, so I just ensure he's sitting back and his shirt is between the straps and him around his neckline. The 5-point harness is so easy to tighten and I seem to get them tightened better than other seats we've had. The latch system is easy to install and uninstall from the car. I've never had a seat that was so easy on either of these points! Transferring the seat back and forth between our cars is a breeze! I love the white line to indicate that the straps aren't twisted. Totally love the shoulder pads. Not only do they keep the straps from getting twisted, but they stay in place. I don't have to worry about adjusting them. This seat fits perfectly in our car which has bucket backseats, which was a worry for me. I recommend Recaro and their seats any chance I get. It's a brand I trust and love. I bought this a year ago for my 4 year old. His other Recaro had expired. He had to have red! I've always bought Recaro! My 8 year old has the Performance Booster. They are awesome, safe seats! Great features and she prefers over her others! Bought almost three years ago and we love it!!!!!! We were in a wreck that totaled my car and my 3 year old who has used this car seat for 2 years was in her Recaro Performance Ride. She suffered no injuries, or pain at all. She wasn't jerked around and was perfectly fine in her seat when she was taken out of the car. I will continue to buy Recaro brand for as long as I need to knowing they will protect my child. I am so grateful for this seat. Thank you! I love this carseat! It is super well made. It is easy to install with seat belt since I don't have latch system in my car. Latch system is also easy to install, I've done it on my sister's van. Easy to carry with the handle when I do have to move the car seat to a different car. Thank you. Our 4 1/2 y/o girl has been in this seat since she was a year old and has loved it backward and forward! The seat is comfortable for the many long trips we've traveled. Our son is 8 and loved his Young Sport (purchased after many comparisons of safety and comfort with other seats). He still uses it as his booster. Recaro has served us very well and we highly recommend their seats to friends and family- and anyone who asks. I just received the Performance Sport seat for my daughter, hence the 3 star rating because I'm still on the fence about it, but the first big drawback is that the lower LATCH system cross belt is not long enough to reach both anchors in my 2010 Mazda RX-8. Would it kill Recaro to add a few more inches to the length of that thing so you can get it attached without crushing your hand and scraping your knuckles trying to get it latched? I gave up and used the standard seat belt to secure it. We love Recaros! We have two! My husband knows all about racing seats and when it came time to buy a car seat for our first child he said Recaro offered the best. We have loved it and just bought our second Recaro for our second child bc number three is on the way. We needed to fit three seats in our Acura MDX and bc of the size if the Recaro we were able to fit our infant seat and two Recaro Performance Sport car seats. I love the protection it provides, the HERO harness system has perfect shoulder pads protection and we've never had a problem with twisting straps. We will definitely buy from Recaro again! When looking for a new seat we needing something that would provide the ultimate safety for our kiddo. It fits perfect into every car we have put it, even dad's racecar! The cover is stylish, cleans easily, and provides comfort for those long road trips! -I wouldn't trust any product like I do a recaro! Great seat with incredible value with the length of time it can be used we love our performance sport, fits well in our little sports car so our son can go for rides in " daddy's race car"
We bought this seat when my daughter needed a new seat. It is very sturdy and easy to install. She loves it. My husband is a FF/medic and CPST and we only use Recaro for our kids. At first I wasn't sure about this company until my husband wouldn't let it go. After doing my own research I realized he was right, this is a must have brand. Our now 5 yr old has this exact model and we LOVE it. Not only has he been in it since forward facing but I can also fit into it. I'm the height requirement for the min legal size to no longer sit in a car seat/booster. This car seat gives me the comfort in knowing my child will be safe till he outgrows the need for it. If you have a taller child this is the seat for you, and the added max weight for harness use also sold me on it. Love my recaro car seat and so does my daughter because she always falls asleep on this one. Easy to use, install, clean, and one of the top safest car seat. I've researched hard on a convertible car seat and this one sold me! After much reading a whole lot of reviews from recaro and friends recommending me this product brand. I knew I had to get it for my daughter. Awesome car seat brand and also love the stroller (: and may I add, great customer service! Already recommended it to my other friends. I've had this seat for about 8 months now and it is by far my favorite car seat. I like that the cup holders are not bulky. Also the head wings are nice for when my child naps, her head doesnt roll forward and look uncomfortable. I can also easily install a car seat next to this so that there is room for an adult to sit in the back as well. Hands down the BEST Car seat around!! I did a lot of research on car seats before I chose Recaro. I'm so happy with their product I plan on buying one for my son. My daughter loves her car seat!! I have recommended it to many of my friends. I bought our first Proride for my now 5 year old son. When that carseat was stolen we replaced it again with another Proride. We truly like this seat so we got one for my daughter when she was born almost 4 years ago. The newer seat has been more of a problem for us though as the plastic part that is on the back keeps slipping and jamming the belt track. Uninstalling and putting the carseat in myself with latch is impossible for me and my wrist strength, but I can see that happening with any carseat. I have recommended this seat to many others over the years ! We have three car seats for our almost two year old daughter and our recaro seat is our favorite. She sure approves and always looks so comfortable. We bought this after trying other brands of seats and not loving them. It's so easy to install and my son loved it! Our new baby is now in it too. Love the high weight limits and how long you can use this seat. Highly recommend! Recaro family for life! I've bought both the opal and blaze and love them! They have been the best and easiest car seats that I have ever used! I love that I only turn a nob to make the straps and headpads higher or lower! RECARO’s Side Impact Protection: Designed to protect each of the 5 vulnerable areas of a child in a side impact crash including their head, neck, face, torso and pelvis. (EPS) Energy Absorbing Foam Expanded Polyestyrene “EPS” foam absorbs crash force energy through the ProRIDE for added protection. EasyAdjust: Head Restraint Just the turn of a knob positions the head restraint to properly fit your child, ensuring optimum safety and comfort. SoftTouch: Head Restraint The head restraint is padded with real “PUR” automotive comfort foam for maximum comfort. CoolMesh: Air Ventilation System Mesh insert allows air to flow through the ProRIDE for added comfort. EasyAdjust: 5-Point Harness The harness adjusts with the head restraint. No re-threading is necessary to properly position the harness shoulder straps to your child. QuickPull: Front Adjust Harness Convenient frontally located harness adjuster for no hassle harness adjustment. TrueLock: Belt Lock-Off System Locks the vehicle seat belt in the ProRIDE belt path in the forward-facing position for optimum safety. Designed for use in either the rear-facing or forward-facing positions, the RECARO ProRIDE Convertible Car Seat offers multiple safety features such as side-impact protection, a head restraint, and a vehicle belt lock-off mechanism (forward-facing). Plus, an ergonomic shell structure, breathable mesh fabric, and easy-to-use harness and head restraint adjusters provide comfort and convenience. Tested to international standards, the RECARO ProRIDE offers an intelligent design that protects a child during a side-impact incident. The car seat's enhanced head wings shield the head and face while a head rest limits neck movement. For added safety, reinforcements at the sides, hips, and thighs help stabilize the torso and pelvis areas. The EasyAdjust, five-point harness can be customized to properly accommodate your growing child. It adjusts with a simple turn of a knob without the hassle of rethreading any straps. TrueLock belt lock-off prevents any slippage from your vehicle's seat belt when used forward-facing. The RECARO Safety Stripe System is a racing-inspired white stripe that is clearly visible on the outside edge of the 5-point harness. This stripe is designed as an easy alert to parents that a twist could occur, or has begun, thus preventing a safety hazard. Designed with a push-button LATCH system, the car seat is easy to secure to your vehicle. The car seat offers a universal top tether system as an added anchor. The rear-facing recline lever allows you to adjust the seat to best fit your vehicle's backseat. Assembled in the United States, the car seat meets all Federal Motor Vehicle Safety Standards for Child Restraint Systems (FMVSS 213) and Flammability of Interior Materials (FMVSS 302). It is also certified for air travel when used with the plane's seat belt. Featuring an ergonomic shell structure that offers support for your child, the car seat is pleasant and cozy for short errands or long road trips. The harness system features soft pads to make it more comfortable. The head restraint is designed with protective and comfortable automotive PUR foam. For comfort and safety, the soft, cushiony car seat is made with expanded polystyrene foam (EPS) that absorbs external forces. For no-fuss care and maintenance, the ProRIDE car seat comes in a variety of easy-to-clean fabrics and colors. All cover materials include mesh fabric that provides a superior air circulation system to keep your child cool and comfortable during the ride. The car seat offers storage pockets to keep the loose ends of harness belts tucked neatly out of the way. 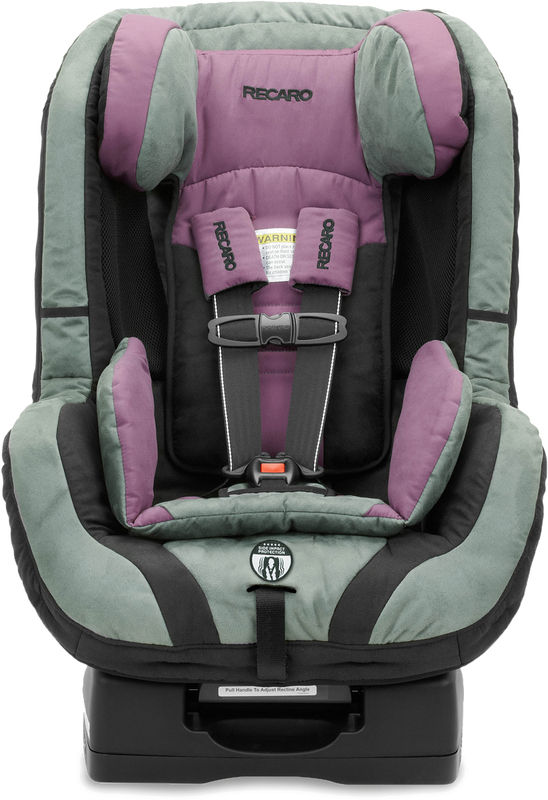 The RECARO ProRIDE Convertible Car Seat is backed by a limited one-year warranty. RECARO pairs a long history steeped in expertise and research of auto racing safety with strong partnerships among leading automotive companies to design safe, comfortable child car seats. With expert knowledge on current and future automotive seating technology, RECARO launched its first child car seat in 1998. Whether designing, engineering, and manufacturing seats for luxury high-performance race cars or seats that carry the most precious of passengers, RECARO is dedicated to combining smart design with the highest quality of materials.